Oxygen-transparent is a modification of KDE Oxygen-style to add cool transparency. It was supposed to be merged to KDE 4.6, but the idea has been dropped due to issues with the theme. However, it can be installed in KDE 4.5 and 4.6 currently. I am using KDE 4.5 in Fedora 14 and here is how I got it installed. Having said that, lets continue. Run the following command as root to install build dependencies. To run as root, type “su” followed by your password and then enter the following. To make the installation easy developer HugoPereira has written a script available at KDE-Look.org. Download and save the script to an empty directory and make it executable. The script will download the latest sources from svn, then runs cmake and compiles the code locally. type “cd build; make install” (as root, or using sudo) to install. That should install the modified oxygen theme. Log out and log back in to see the changes in effect. Also, after logging back in, you can configure the theme by running oxygen-settings (Alt+F2 and type in oxygen-settings). 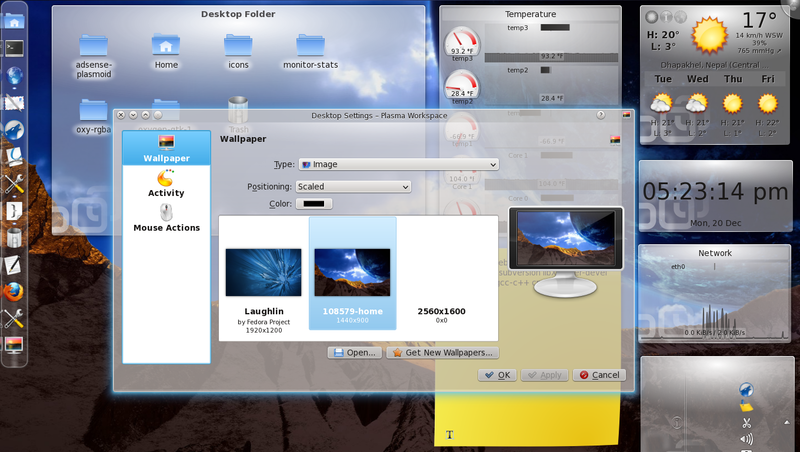 Open up “System Settings”> “Application Appearance” and press “Configure” to adjust transparency values. Hey. What is the name of docker that you use?? The one in the screenshot is daisy, but currently I use avant-window-navigator. I recommend cairo Dock as Docker . . . it´s really awesome . . . has just one issue, you have to turn off open-gl mode within the docker otherwise the video overlay window in kaffeine will be transparent but this make no difference in usability.